The Progress-Focused Approach: Will the future be better? What would your answer be to the question: will the future be better? The answer to this question turns out to depend on whom you ask and on what it is specifically focused on. 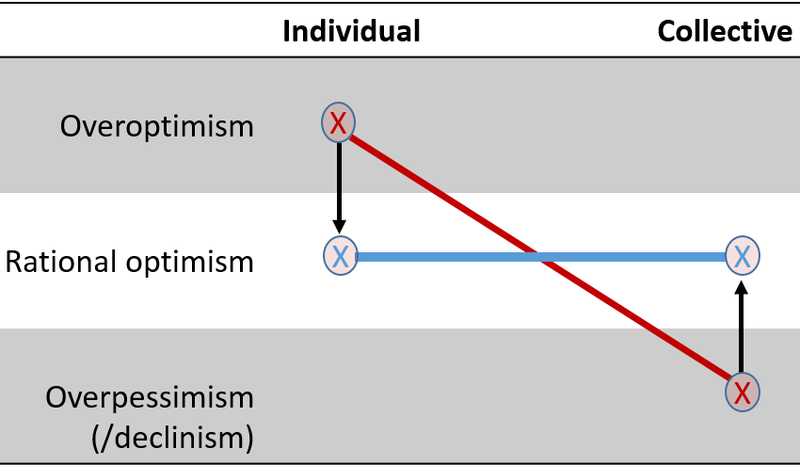 Mohammed Nagdy and Max Roser explain in their article Optimism & Pessimism that many people are individually optimistic but, specifically in developed countries, socially (or collectively) pessimistic. In other words, they expect that their personal future will be good but the future of their country not too good. This individual optimism is relatively stable. Collective pessimism is less stable. It is influence by recent events and recessions. Another remarkable finding is that many people are locally optimistic and nationally pessimistic. They expect that things will go generally well in their near environment but not in the country ar large. People appear to be have individual overoptimism. They underestimate the probability of negative events in their lives, like diseases and divorces. Also, many people can be said to have collective overpessimism. There are two sides to this. First, they have a skewed picture of developments in the world up til now. They tend to think that the world is getting worse in many respects while an abundance of data shows that the world is getting better in countless ways. People lack information about the many forms of progress which happen day in day out and year in year out. Media coverage of negative events gives them the impression that things keep getting worse. A second aspect of this overpessimism is declinism which is the belief that one's country is in decline. Many people in developed countries, to some extend, have this belief. As the graph below (source) shows many people in emerging and developing economies are optimistic about the future, while many people in advanced economies are pessimistic. An important reason for declinism is that people in advanced economies confuse relative decline with absolute decline. That the Chinese economy grows faster than the American economy is interpreted by many Americans that the American economy is going down which is not true. Moreover, the emergence of the Chinese economy might be beneficial to the American economy rather than harmful, among other things because of the huge market which emerges. 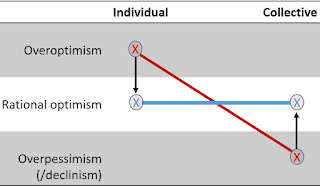 It is of great importance that the mentioned systematic biases of individual overoptimism, collective overpessimism, and declinism, are corrected. All these biases can lead to bad decisions and needles depression. We must develop rational optimism which is characterized by acknowledgement of problems and threats, recognition of achieved progress, and a clear idea of which progress further needs to be made.